How do you help children to see the world from perspectives other than their own, especially in a developmentally appropriate way? That's been my driving question as I create programming for our annual two-month initiative, Coming Together in Skokie and Niles Township. Our theme this year is Voices of Race, and the premise is to facilitate the building of knowledge and appreciation for the diversity in our community. That's a tall order--often conversations on these topics are uncomfortable, in particular if they are in fact deep conversations and not just superficial platitudes. It's an especially tall order with children's programming, but as it's also vital to a mission for anti-racist librarianship, we've been offering these programs. For the youngest crowd--preschoolers--I wanted to stick with a somewhat traditional storytime format. I approached my program for this age group armed with some brain research: specifically, that from a very young age children try to understand the world by categorizing everything they see and learn. That means the default setting for the young brain--and the foundation on which older brains are built--is a "these things are the same, these things are different" premise. When race and perceptions of race are socialized from such a young age, with the young brain automatically sorting information into "same" and, essentially, "other," this can ingrain a certain amount of racial prejudice without anything ever being specifically taught. 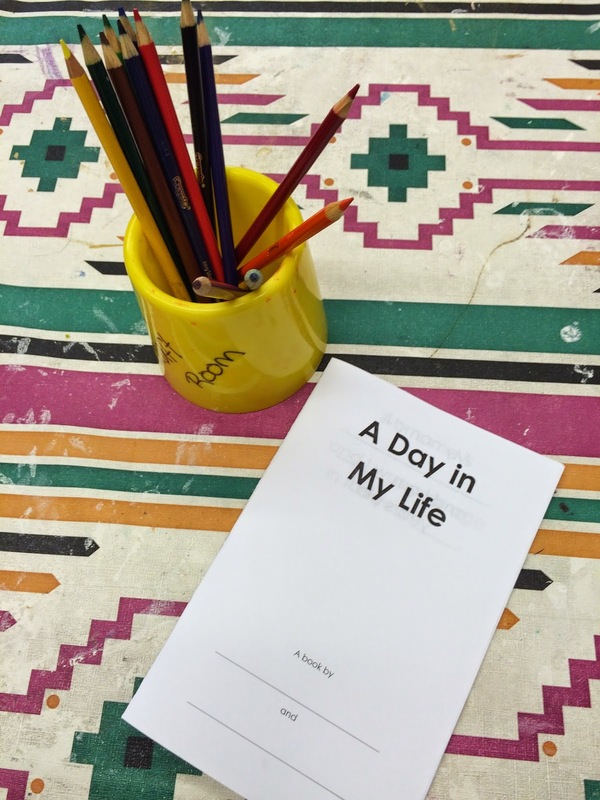 My goal for this storytime, then, was to share stories, songs, etc., of people who might at first glance seem different from what the kids were personally familiar with, but who are ultimately much more alike the kids than different from them. Our goal was to work on seeing commonalities between ourselves and people who may not look, talk, or act like us. It was a very basic concept, yes, but it was developmentally appropriate for the 3- to 7-year-olds who were in the evening program. "My name is ____, and I am __ years old." / "My name is ____, and I was your age in the year ___." "I live in ____." / "When I was your age, I lived in ____." "During the day, I ____." / "When I was your age, I would ____ during the day." "In my free time, I ____." / "When I was your age, I would ____ in my free time." "When I grow up, I want to be a ____." / "When I was your age, I wanted to be a ____ when I grew up." My goal was to invite children to recognize that different people have lived different experiences than them, and having this conversation with a beloved adult helped to get conversations started. 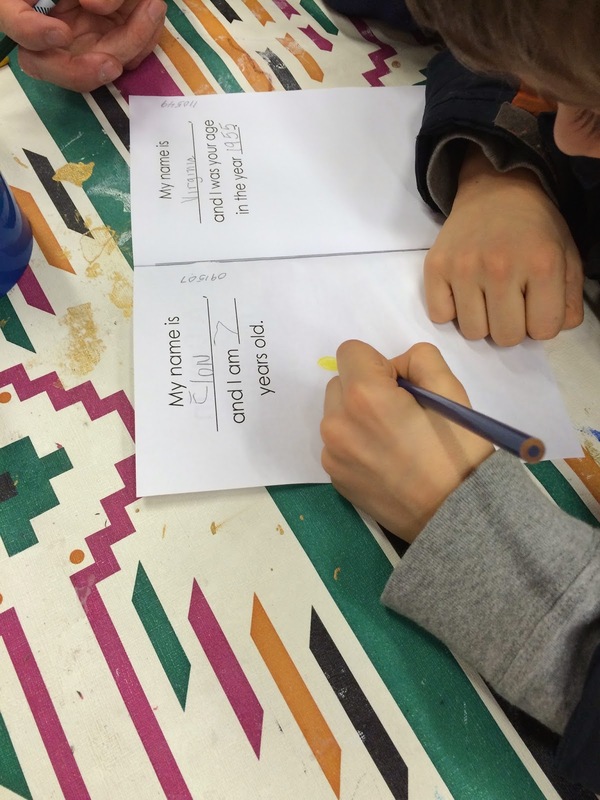 I heard some terrific interactions going on as the pairs wrote and draw in their books. One grandson learned his grandmother's first name for the first time. Another pair talked about Brown v. Board of Education, which had occurred in the year another grandmother was the same age as her grandson is currently; the grandson was rapt to listen to not only what the decision was, but his grandmother's memories of its impact. One table had three generations present, and throughout the conversations I could occasionally hear the middle generation saying "I didn't even know that about you." Families don't always have these types of simple, straightforward conversations, even though they make everyone feel closer. And if families don't have them, it's even more of a stretch to expect strangers to have them. So we've got to start somewhere. I was so impressed with how the kids and their caregivers took the starting premise--a simple book with fill-in-the-blanks--and really expanded on it. One pair ended up making a list comparing facets of 2015 with facets of 1954. Another talked about all the different careers that are open to girls now that were effectively male-only 50-60 years ago. Each pair left the program expressing their thanks at getting them started in these conversations, and I encouraged them to keep talking--with one another, with other family members, with friends, etc. Finally, for an older-ages program for the Voices of Race initiative, we brought in a teacher-artist from Chicago Slam Works, an organization supporting social justice through poetry. The teach-artist offered workshops for 4th-5th graders, junior high students, and high schoolers, each of which included an exploration of slam poetry and its power. The workshops really focused on the kids themselves reflecting on their own voices and stories, then putting those down to paper. Many shared their poems with the group--a practice that was uncomfortable at first, but ultimately rewarding. It can be hard to know, let alone share, our own stories, but there is power in them. We can all benefit from listening to more voices, and seeing the humanity in each of them. Guess what? My library is hiring a Youth Services Department Manager! Skokie Public Library is a 5-star library and a wonderful place to work. The library is truly the heart of our vibrant village. There are so many fantastic, dedicated folks here, and you can apply to be one of them! Are you a creative, passionate, and agile leader who has a strong understanding of child development? 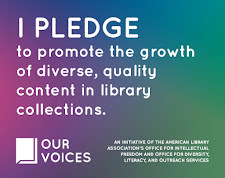 Do you have a vision for how libraries can provide children and families with an engaging public library atmosphere and spot-on recommendations for books, movies, and music? 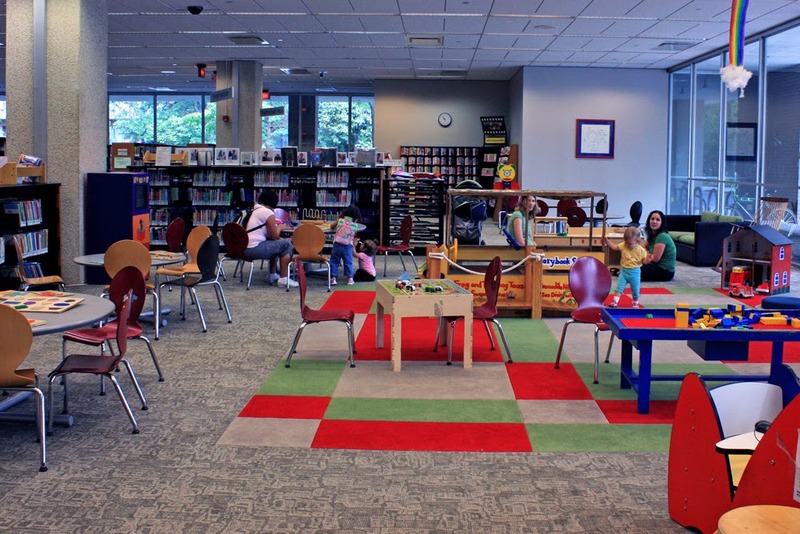 Bring your experience and expertise to Skokie Public Library as its new Youth Services Manager. As a member of the management team, the Youth Services Manager will take the initiative to explore new ideas and trends impacting services to children and families. This work will involve frequent collaboration with other leaders in the organization and developing a talented group of staff members. Strong communication skills are essential.